Automatic processes represent our mind’s ability to react unconsciously, quickly, and without thought. They include our ability to do many things on auto-pilot with little cognitive effort. We do this all the time, all day, every day. Our brain’s automatic processes kick in so that our minds can organize and filter all of the input we receive on a daily basis. This is even more necessary in this age where we are bombarded with so much input. It is good to have automatic filtering processes to help. Automatic processes and being able to do many things on auto-pilot makes life easier in many ways. While automatic processes serve their purpose, they have their downside. They can inhibit our capacity to achieve a higher state of mind, an abundant mindset. Processing all the information that we are confronted by is a battle between our brain and the incoming thoughts. Very often our minds automatically simplify thoughts and perceptions. This way we spend less time and thought on things that are unimportant, which leaves more cognitive resources for the important thoughts. While many times being on auto-pilot can serve us very well in everyday life, and is necessary to some degree, it can interfere with some vital cognitive processes. Because our minds are simplifying thoughts, we may often make assumptions regarding the meaning of communication too quickly. We may also pay less attention to some of the most important facets of life, including the beautiful things that are occurring around us every day. Taking note of and appreciating the beauty and details of life is often sacrificed because of the cognitive economy driven by our automatic processes. Abundance is a state of mind. It is the art of opening up your mind to perceive, appreciate, and create. It entails being mindful and present in the moment. 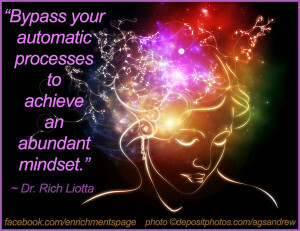 Indeed an abundant and present state of mind requires bypassing the automatic processes that may get in the way. Appreciation is key to an abundant state of mind, an abundant mindset. Our automatic processes are geared toward efficiency, not appreciation. Our automatic processes are not designed to optimize our ability to be present and slow down time so we can discover what is new around us. Very often our mind’s automatic processes get in the way of achieving an abundant state of mind and our perception of all that is worth appreciating each and every day. 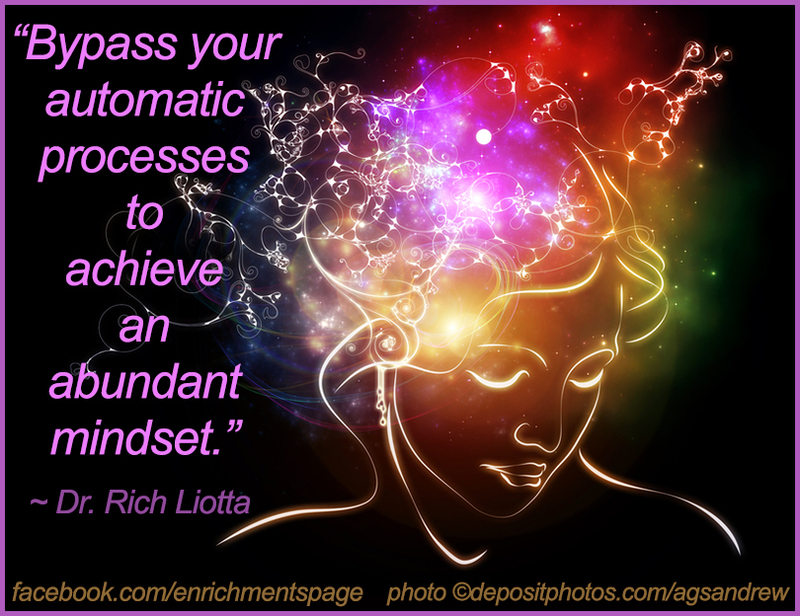 Shutting down or bypassing automatic processes is critical to achieving an abundant mindset. It is challenging but not impossible. It involves conscious effort. It involves a shift in your intention. You need to slow down, drop your assumptions, and open up your perception to what may be new and surprising. So often our minds automatically make assumptions about how things are. These assumptions are automatic processes and are often the deciding factor for your mind about a thought’s importance. Part of limiting your automatic processes means leaving aside assumptions and paying more attention to details. This involves a conscious effort to slow down and look at things to determine if something is different, unique, and warranting attention. Our mind is programmed to notice what is new and what is different, but often things are missed because of the assumptions that we make in our mind for the sake of cognitive economy. Appreciation is a fundamental element of the abundant state of mind. Appreciating is so important to a healthy, balanced life. It is a gateway to other aspects of abundance. While appreciation seems like it should be an automatic process, this is not the case. Appreciation requires a mixture of how we perceive something and how we evaluate what we perceive. It is a conscious action that you decide to make. It is not automatic for most of us. When your frame of mind supports appreciation you will notice that there is more to something than meets the eye. In order to truly appreciate something you must think mindfully about it and truly notice it. This may mean looking at things from multiple different perspectives. Maslow’s concept of “freshness of appreciation” was developed when he discovered that individuals who were self-actualizing had a greater ability to appreciate the ordinary events within their lives. These individuals took the time to notice the little things. They would notice and see the beauty in things they may have experienced countless times (flowers, sunsets, working etc.). They had a “freshness of appreciation” toward all elements of life. These individuals found greater life satisfaction. Clearly, they had learned to move beyond the automatic processes that interfere with appreciating our experiences. Even the challenges you face have elements that can be appreciated. In reality we often have a hard time doing this until the challenge has long passed. But wouldn’t it be useful to feel appreciation even during challenging times? Appreciating challenges does require some imagination and stepping outside of your mental box. If you stop to truly reflect about something, get some perspective, and look at it in a different way, it is far easier to appreciate it. This makes it much easier to accept challenges or other tribulations no matter what they are. Another important suggestion to consider is asking the question “What if?” What if I’m not seeing everything that is happening now? What if there is something here that I am not noticing? Is what is happening for a purpose, for the greater good, or for my own development? What if? All of these questions encourage you to delve further into the depths of an idea or issue, beyond your automatic and limiting conclusions. Question the obvious. Often what you may find are new possibilities or a new answer to an old question. This is insight worthy of appreciating! These questions are helpful in general day-to-day coping, but are also essential to gaining an attitude of appreciation and an abundant mindset. Life is busy, stressful, and sometimes it is just plain hard to manage. Despite these difficulties, take the time to bypass your automatic processes, appreciate, question the obvious, and open your mind to abundance. Appreciating the blessings, especially amidst a crisis is a wonderful coping skill. There are a myriad of things to appreciate every single day. Take the time to notice and enjoy the good in life, and you will exponentially improve your life satisfaction! The fact is if you practice this often enough it will become another form of your own automatic process. You can gain control of, and alter your own automatic processes for the better, changing the very structure of how you cognitively process your world. Having a mind and heart that are grateful and appreciative of the little things in life will automatically lead to more creativity and happiness. This entry was posted in Abundance, Mind and tagged abundance, appreciating, appreciation, automatic processes, change, creativity, Happiness, personal development, personal growth, self-discovery, self-improvement. Bookmark the permalink. Thank you for this good article. What you said about “What if” is a good observation. Before you are interested in a subject you voluntarily ignore it and when you start to be interested init you start noticing it at every step. It`s funny how our minds work.